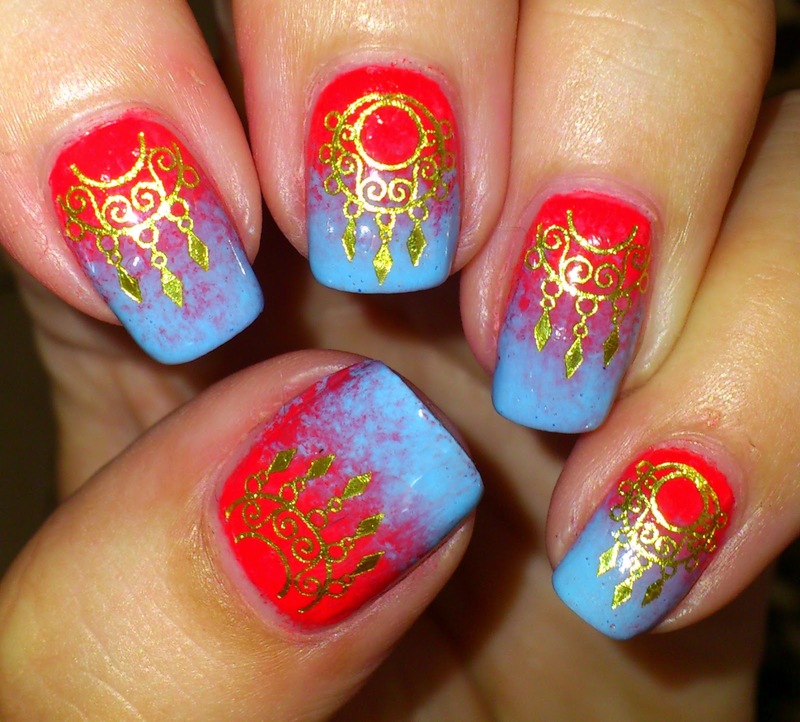 Indian Glamour Gold water decals from Sparkly Nails over a red and sky blue gradient. The gold decals are lovely and shiny and really pop on top of the red polish. There are 20 decals in the pack and I've applied one of each design to my nails. Intricate designs which look stunning. The 'Indian Glamour' Water Decals currently cost £1.65, amazing value when you think of how many manis or accent nails you can can create with these wonderful water decals. Available at Sparkly Nails who have an huge range of nail art items; they offer a loyalty and an affiliate scheme, go sign up, I have, you may as well save as you spend! I love the color combination. Very bold and it suits the theme very well. Perfect Bollywood nails!